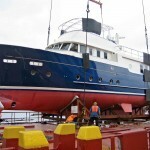 Read on for more details and photos of this amazing trawler. News has it that Sea Spirit, a Sea Spirit Passagemaker 60 is for sale. A blog post appeared several days ago indicating that M/V Sea Spirit is for sale. We sure hope that Dan keeps blogging. Off-season update – and are we trading Sea Spirit for a bigger model?